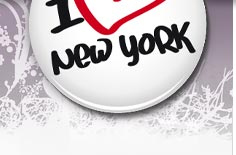 I Love New York - New York City, Manhattan, NYC, shopping, museum, hotels. The gas on Broadway is replaced by electrical ligths. Opening of Macy´s at 34th street. /The cities "first" skyscraper stands ready - Flatiron Building - 87 meters high. The building is known for its three angular form in the crossing at 5th Ave and 23d Street. New York Times move their office north up to Longacre Square - present Times Square. / The first official subway (under ground) is opening Oct 27 - the route line is between City Hall and 145th Street & Broadway. The luxury Plaza Hotel is opening at Central Partk South and 58th Street at 5th Avenue. The hotel is for the moment closed (2006) for renovating and is planning to open again in the beginning of 2007. Donald Trump buys the hotel 1988 for 407.5 million dollars and is saying in a open letter in New York Times - "I haven´t bought a house, I have bought a masterpiece - the Mona Lisa. It is the first time in my life I haven´t made an economic deal...."
One day at Ellis Island it arrived sky-high amount of immigrants to Ellis Island - approx 11,745 persons. Grand Central Station is opening. / The Woolworth Building is standing ready as the worlds highest building (792 feet) /The worlds first cinema auditorium is built - the Regent Theater at 116th Street..
250 years ago when the Englishmen took over New Amsterdam from the Dutch./ The city gets a new flag, with the same colours as the Dutch flag 1625 (orange, white and blue). More information about the flag of New York you will find here » . Checker Cab Manufacturing Company is founded by Morris Markin and the characteristic yellow/ black cabs is starting to roll on the streets of New York. The cabs are not yellow by mere accident. An investigation made by the university in Chicago came up with that the yellow color is the easiest colour for the eye to notice. The nightclub Cotton Club is opening in Harlem, black entertainers perform for mostly white public. Here perform among others Duke Ellington. Yankee Stadium is opening in the Bronx. The Tuesday when the big stock-exchange crashed. Chrysler Building inaugurates and is the worlds highest building - 1,048 feet. Empire State Building inaugurates and now becomes the worlds highest building - 1.250 feet. / Construction workers at Rockefeller Center starts the tradition with placing a christmas tree at the building place. Radio City Music Hall is opening. Frank Sinatra is on stage at the New York Paramount Theater. John D Rockefeller is donating land on Manhattan, to build the United Nations headquarters at 760 United Nations Plaza. Ed Sullivan starts his successful TV-show - The Ed Sullivan Show (1948 - 1971) - the show is transmitted from CBS Studio 50 in Broadway . Here intreviews are hold with several celebrities and also performance by several celebrities as among others: Dean Martin, Elvis Presley, Jerry Lewis, Beatles, Nat King Cole, Aretha Franklin, The Supremes and Rolling Stones. At the same place today (2006) David Letterman performs his TV-show - The late Show with David Letterman. The Solomon R Guggenheim Museum - called The Guggenheim - moves to 89th Street and Fifth Avenue and becomes famous for its design by Frank Lloyd Wright . The Beatles takes New York with storm. / The Verrazano Narrows Bridge is opening. The firts New York City Marathon is held - with 126 runners in Central Park. The "Big Apple" is starting to be used in marketing for New York . The TV-comedy show Saturday Night Live (SNL) has its opening night. The show is broadcasted from Studio 8H at Rockefeller Center. 2005 the contract is renewed on the show to 2012. Here have several well known comedian and stars performed as among others: John Belushi, Bill Murray, Dan Aykroyd, Robert Downey Jr, Gilda Radner, Chris Farley, Adam Sandler and Mike Myers. Most of them have started their shows with the words - "Live from New York, It's Saturday Night!" World Trade Center´s twin tower is opening downtown - the financial districts in New York. .
Nigthclub/Discotheque Studio 54 is opening at 254 West 54th Street (1977-1986) by Steve Rubell and Ian Schrager. Here the beautiful unknown and well-known were packed together. Rubell himself handpicked which persons who should enter. Here were celebrities as: Muhammad Ali, Woody Allen & Mia Farrow, Warren Beatty, Björn Borg, David Bowie, Chevy Chase, Bo Derek, Rod Stewart, John Travolta and Britt Ekland and many more. John Lennon was murdered outside his flat, the Dakota apartment building. "Black Monday" (Oct 19), the stock exhange went down with 22.6%. Ellis Island Immigration Museum is opening at Ellis Island. World Trade Center (WTC) was bombed by terrorists. A truck full with explosives detonates in the garage under the north tower and open up a 30 meter big hole in the building. 6 persons were killed and thousand persons were wounded. Town is going through a major change and the number of crimes are reduced drastically! New York is now becoming known under the name - one of United States safes towns. The governor Mr Guiliani (1993-2001) is fighting the crimes and during his period crimes are reduced drastically. He also implement a renovating of Times Square and makes New York to a turist attraction again. Amount of crime is down to the lowest level in 30 years, during Mr Giulianis time as a governor. Last day when Checker Taxis is rolling on the streets of Manhattan. The Millenium/New Year's Eve is celebrated with pomp and ceremony at Times Square. World Trade Center (WTC) is struck again by a terror attack and both twin towers collapse, after two aeroplanes flew in to both towers. Nearly 2.600 persons were killed in the attack. ABBA musical "Mamma Mia" has opening night at Broadway. The musical has got it´s name from ABBA´s hit from 1975 and also include a number of fantastic songs from their career. The musical is still playing (2006). The construction work of Freedom Tower is starting at the same place as former WTC. The building will be 102 storeys high and 541 meters, including the spire in the top. The plan is ready for moving in 2011. Alexander Hamilton U.S. Custom House at One Bowling Green celebrate 100 years. The old Custom House is today home to The National Museum of the American Indian. You will find more interesting information about the old Custom House in New York here.